The 2019 Sheehy Skeffington School on Social Justice and Human Rights will be held on Friday 10th of May, The Teachers Club, 36 Parnell Square West, Dublin 1 (registration opens 5.15pm). The theme is : Rediscovering Democracy and the Common Good: The Contribution of Human Rights. Reserve your place (attendance is free) on this link. The inaugural meeting of the Sheehy Skeffington School on Human Rights and Social Justice took place in 2012. The School was formed to provide a space for reflection on the formative years of the revolutionary period, being especially conscious of the need to compare the aspirations of the early revolutionaries with the political, social and economic outcomes of the modern state. The particular focus of the School was to explore what progress had been made towards realising the socially justifiable goals of that era. The events of interest included self-determination, the embedding of democratic principles, cultural revival and the struggles for economic and gender equality, labour rights and the eradication of poverty. While the retrospective lens of the School was always a human rights one, it was tempered by the reality that these events took place some 30 years before the Universal Declaration of Human Rights. Nonetheless, the concepts that informed that period were firmly grounded in the progression of human dignity as the cornerstone of a civilised and righteous society. The abolition of slavery, the development of notions of liberty, equality and collective action, the struggles of the suffragette movement and the emergence of an economic analysis of capital all contributed to the emergence of what is understood today as a human rights paradigm. During the seven years of the school topics, insights and viewpoints have been presented by academics, activists, parliamentarians, lawyers, actors, poets and musicians. Many have been thought-provoking, others captured the generative emotions of the period and some provided insightful, even radical, interpretations of events and consequences. The School will complete its sequence of schools in 2019 with a somewhat different evening format. 2019 marks the centenary of one of the final steps leading to an assertion of independence and the formation of the Irish state. In 1919 the first Dail met in Dublin’s Mansion House. 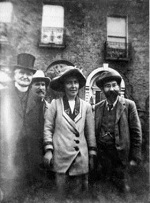 Following their successes in the 1918 Westminster election, the Sinn Fein movement was anxious to convert its mandate into a political and parliamentary presence. While still a covert undertaking, the first Dail conveyed an assertiveness and authority that quickly percolated down to control of local authorities and the formation of an alternative courts system. While it would take a military struggle to bring matters to conclusion, the establishment of a republican parliament signalled the beginning of the end of colonialism in Ireland. That first Dail is noted for its adoption of the Democratic Programme, a proclamation of intent to set down, and implement, a programme of social reform, including the eradication of the Poor Law and its replacement with a system of health and welfare, especially focusing on the well-being of the most vulnerable – children and the elderly. The Programme also committed the State to preparing its people for active citizenship through education and training and the development of industry along progressive cooperative lines. The solidity of that parliamentary base ensured that the revolution, notwithstanding a short but vicious civil war, was not preceded by years of mayhem and authoritarian dictatorship. This was a commendable achievement for the novice state that underpins its democratic principles and common good commitments, even if these fell well short of their social aspirations. A century later, we are living through an age of enormous change and acute uncertainty with democracy and the human rights gains that were so hard won under mounting threat. The early 21st century has been marked by further resource accumulation by elites, the conversion of wealth into political capital, the increasingly perilous state of the planet as a result of climate breakdown, the exploitation by populist politicians of the unfocused anger of many of those left behind by the pace of economic and cultural change and the trumping by loutish rage of democratic decision-making. Against this background of disturbing change, it is urgently necessary to revisit democracy as a concept that can deliver human rights. The democratic model needs significant reconfiguration because it is being usurped and undermined by those with only selfish interests who are rapidly normalising dangerous behaviour and challenging the basic norms many of us take for granted concerning the treatment of other human beings. The 2019 Sheehy Skeffington School will focus on how the democratic model can best be reconfigured in a way that protects democracy itself and safeguards human rights and human dignity. This is an urgent task that we all need to take seriously in order to preserve participatory democracy and prevent the dismantling of the human rights structure built so carefully and with such difficulty over many years. The speakers at this year’s school who will address these crucial issues are: Michael O’Flaherty, Director of the EU Agency for Fundamental Rights; Susan McKay, author broadcaster and journalist ; and Dr Carol Coulter, Director of the Child Care Law Reporting Project. We hope you will join them, and us, for what promises to be an insightful and purposeful school.